"Mama" combines different elements from other successful horror movies. What we all get is a jack-of-all-trades. One that is interesting enough but never really becoming special or memorable or unique. Now, do not take this as a bad thing as "Mama" is definitely one frightening, riveting thrill ride that completely effective in oozing out that creepy factor. If you want to get scared then "Mama" is the perfect film to watch right now but if you want something new, then maybe you could look or wait for something more original. During the 2008 financial crisis, Jeffrey (Nikolaj Coster-Waldau), the father of Victoria (Megan Charpentier) and Lilly (Isabelle Nélisse), kills his business partners and wife when he breaks down. As he tries to escape the authorities, he kidnaps his two daughters but unfortunately gets into an accident. All of them take shelter in an abandoned cabin as Jeffrey decides that he must kills his daughters too. As he is about to shoot Victoria in the head, a specter grabs him and kills him. Five years later, Jeffrey's brother Lucas (Nikolaj Coster-Waldau) has not yet given up on finding his nieces. Luckily, the cabin is finally found and the two girls are finally saved. Unfortunately, isolated captivity has affected both their psyches as Victoria and Lilly have found shelter on an unknown figure they named "Mama" (Javier Botet). At first, they think that Mama is only an imaginary friend but as strange things happen to Lucas and his girlfriend Annabel (Jessica Chastain), they soon realize that Mama might be real and might have come home with the two girls. 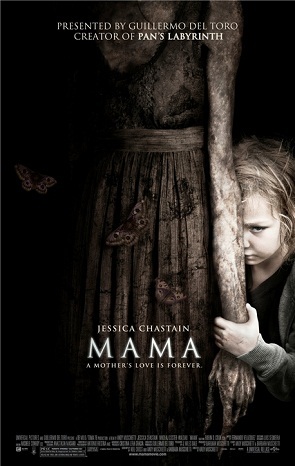 As we said, "Mama" is a mixed bag of various good horror movies. Mama herself seems like a combined version of various creatures we have grown to love in the past. Sadly, the movie does not bring anything new or fresh into the table and we do think this is why it is easy to notice how it copies the other movies of yore. Fortunately for its viewers, "Mama" turns out to be a great horror experience even with this seemingly huge caveat. "Mama" in fact is genuinely scary. The chilling factor brought forth by outstanding acting, visual effects and audio. A combined effort that definitely made us squirm in anticipation more than a handful during the whole film. We also loved its flashback segment/s that had a unique visual representation of Mama's back story. As for the plot, unsurprisingly, it also turns out to be mostly typical although the ending had a twist of its own. In summary, "Mama" is a must-watch in terms of fear factor alone but don't expect to see something surprising to be happening on screen.